WALLEYE Lake of the Woods is the ice fishing capital of North America and the most popular sportfish on the lake is the walleye / pickerel. Walleye fishing is spectacular on Lake of the Woods with double digit fish days on uncommon. Anglers will generally catch a mixed bag of walleye and sauger. The sauger is the smaller cousin of the walleye, and is also great table fare. Generally walleye fishing action is best at dawn and dusk, but fish can be landed all day, depending on the location. The best lures for targeting Lake of the Woods walleye through the ice are a variety of spoons. Many of which are made locally specifically for Lake of the Woods walleye fishing. Some of the prime colours are pink, green, chartreuse, blue and purple. The colour of choice can change from day to day or even hour to hour, so keep on eye on what is successful and be prepared to change lures to entice these finicky fish into biting. Of course most of the spoon presentations are tipped with a lively minnow for added attraction. 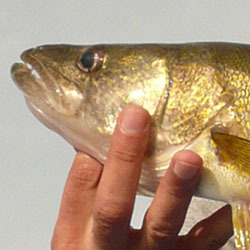 Average Lake of the Woods walleye is 1-3 lbs, although trophy fish in excess of 8 lbs are caught annually. NORTHERN PIKE Lake of the Woods also offers excellent ice fishing for northern pike. Pike in excess of 20 lbs are not uncommon in the lake. The pike's main food forage is walleye and sauger, and will inhabit the same areas where the walleye are schooling. Pike are often caught while walleye fishing, and can be a nice surprise. Ice fishing anglers targeting pike on Lake of the Woods, generally fish shallow under 30ft, and use large shinners, chubs or sucker minnows under a tip-up. Large dead baits such as herring hooked on a deadstrike rig can also be deadly, especially during early ice. PERCH Lake of the Woods also habours a very healthy population of Jumbo Perch. Perch generally school and once you get into a few jumbos, others are not far behind. They will also school with it's larger cousin the walleye, so don't be surprised if you land a few bonus walleye while fishing for perch on Lake of the Woods. The bait of choice for perch is small minnows on perch rigs, or small spoons, similar to those used for walleye. 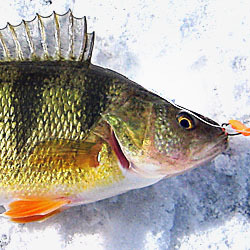 Lake of the Woods perch are excellent eating and catching a dozen or so of these jumbos can make an excellent fish fry. Lake of the Woods has both an USA and Canadian side. Both areas are very busy during the winter months and many ice fishing operators and accommodations cater to the ice fisherman. This is pristine wilderness country, with excellent fishing opportunities, so make your next fishing adventure on Lake of the Woods. Each detailed map provides depth, contours, structure, boat ramps, and updated fishing information. 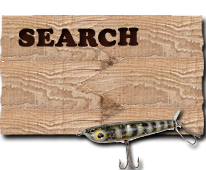 Ice Fishing Lake of the Woods fishing maps also include lake info such as gamefish abundance, forage base, water clarity, weedline depth, bottom composition, complete latitude/longitude grid lines and dozens of GPS waypoints & coordinates.